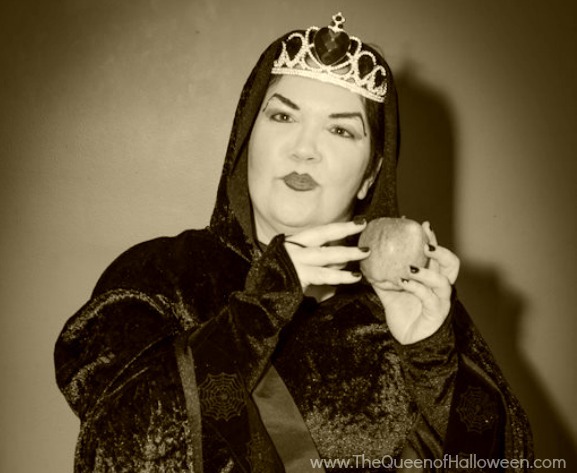 Me as the Evil Queen (aka The Queen of Halloween) taken on October 31, 2012. I am Michelle, your Queen of Halloween and I’m here to bring you anything and everything having to do with the best holiday of the year. My love for Halloween began as a small child in Miami. When I was a kid, the only ways to celebrate Halloween were by wearing your costume to school for a small party, with maybe a costume parade in the afternoon. Then you ran home and began trick-or-treating by walking out your front door and looking for any homes with their porch lights on. Back then you were lucky if you saw the occasional jack-o-lantern or a cardboard Halloween sign on someone’s front door. A few years later I moved to Los Angeles and found it even harder to celebrate Halloween. I can remember buying candy to hand out with my mom and no kids ever coming to my door. When I outgrew trick-or-treating, I was even more heartbroken to find that none of my adult friends wanted to celebrate. I spent more than a few years doing nothing on Halloween night but watching It’s the Great Pumpkin on TV and eating candy alone. It was a sad time to be a Halloween-lover. As years went by though, I was heartened to see more and more adults embracing the holiday I had always loved. Soon I began to find people to celebrate the night with and went to a few costume parties. Every year I would see more Halloween activities popping up for adults, such as scream parks and attractions, parades and more. I also saw more decorations in stores and was excited to fill my home with ornaments so I could celebrate my favorite holiday the entire month of October. Nowadays, Halloween is nearly a year-round celebration for me. Living in a dry climate where rain can be scarce and cold weather is even scarcer, there is no real fall weather in September or October. I’ve gotten (somewhat) used to warm/hot Halloweens, but whenever there is rain, I immediately turn on spooky music to get myself into a proper Halloween mood. Because of this habit, I often find myself in the Halloween spirit as early as February or March (which is when we get most of our rain in SoCal). The real countdown begins for me after the summer solstice, when the sun begins setting earlier each day and I can feel autumn coming. Come September, I am usually checking all of my local stores to see who will being carrying candy and decorations first and I always feel delight the first time I see the displays go up. Starting in late September and going through October, I visit as many as five scream parks (such as Halloween Horror Nights, Knotts Scary Farm and The Haunted Hayride) and begin decorating every part of my home for the holiday. If I am in a neighborhood where I will get trick-or-treaters I will start stockpiling candy and prepping for a party at my home. My costume is often bought months in advance and I usually begin thinking about a new costume on November 1. My friends have come to know me and while at first I used to get funny looks and comments about my love of Halloween, now they have come to expect it and have even begun asking me for advice about decorating or sending me links to websites they know I will like. Many of them have dubbed me “The Queen of Halloween” and the name has stuck, so I decided to use my love of the holiday and knowledge about it to bring Halloween to anyone who wants it. Halloween Future: Decorations, Party-Planning, Music, Movies, Recipes and More! On this site expect to find everything from posts about Halloween decorating and party-planning, to links to helpful websites and Halloween products I like and much more. As your reigning Queen of Halloween it is my goal to present to my people all that they love about Halloween. So take a look around and see what Halloween goodies are here for your enjoyment.